I don’t even know how long it’s been since my last blog posting. We’ve been busy doing a lot of work around the house, but I’ll tell you about that another time. I really like challenges. I tend to do some of my more creative work when I have been presented with a challenge. 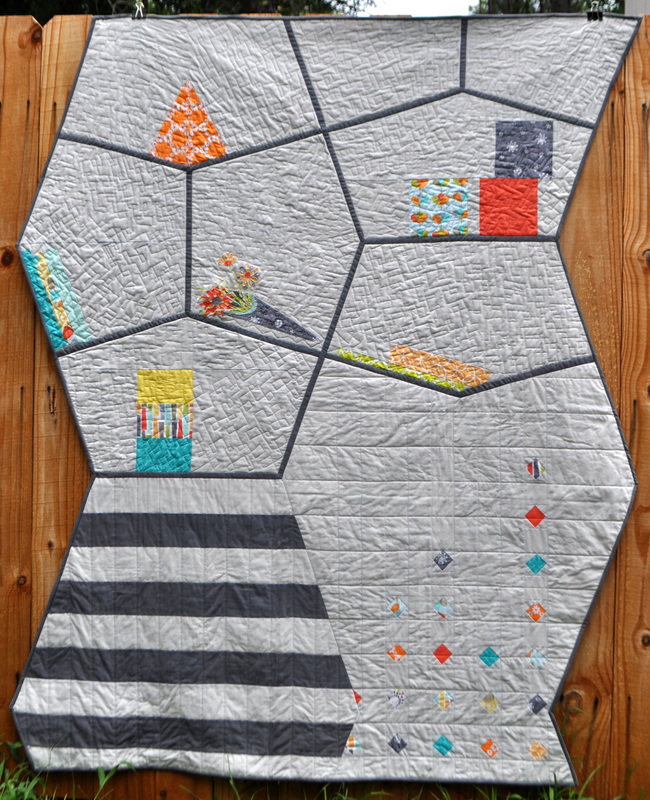 And so it was another challenge, this time from the Modern Quilt Guild and Michael Miller, and a quest for adventure that sent me down the path of designing and creating this quilt. 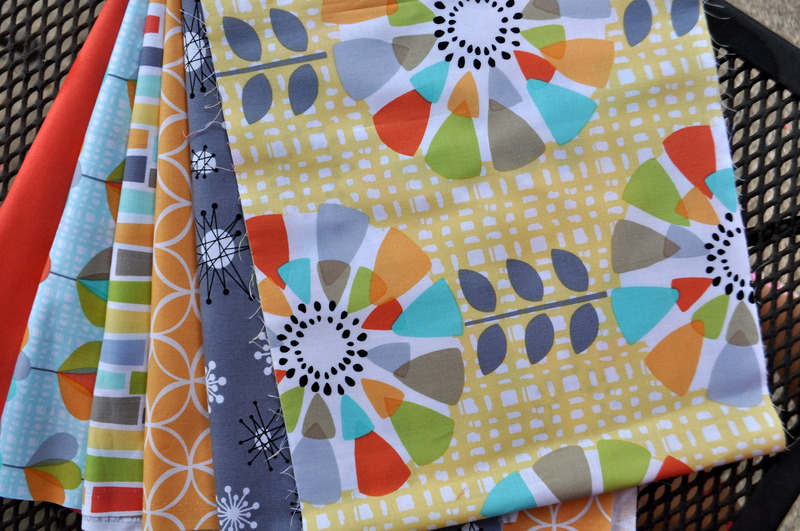 Here are the Michael Miller fabrics I started with. 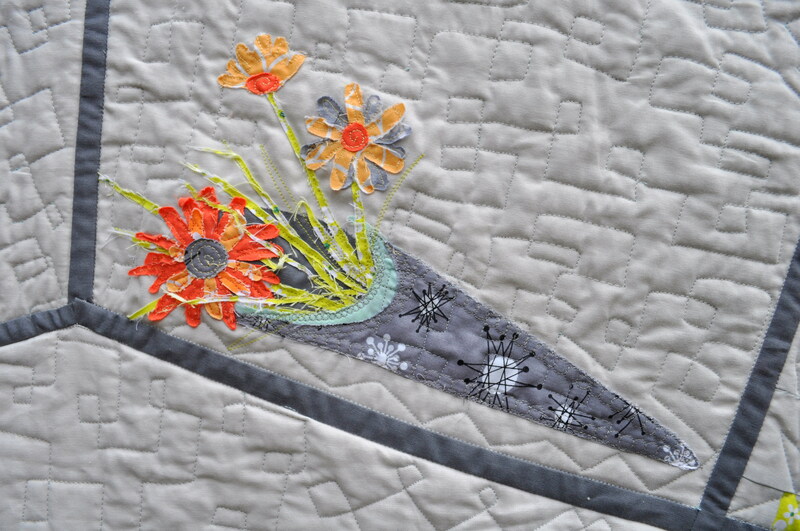 At first I thought I would make a wall hanging with modern flowers similar to the fabric there on top. Then I decided that idea was very ‘un-creative’ and, although it would be beautiful hanging in my house, it just wasn’t good enough for a challenge. Then I started thinking about the shapes that are used in quilts. 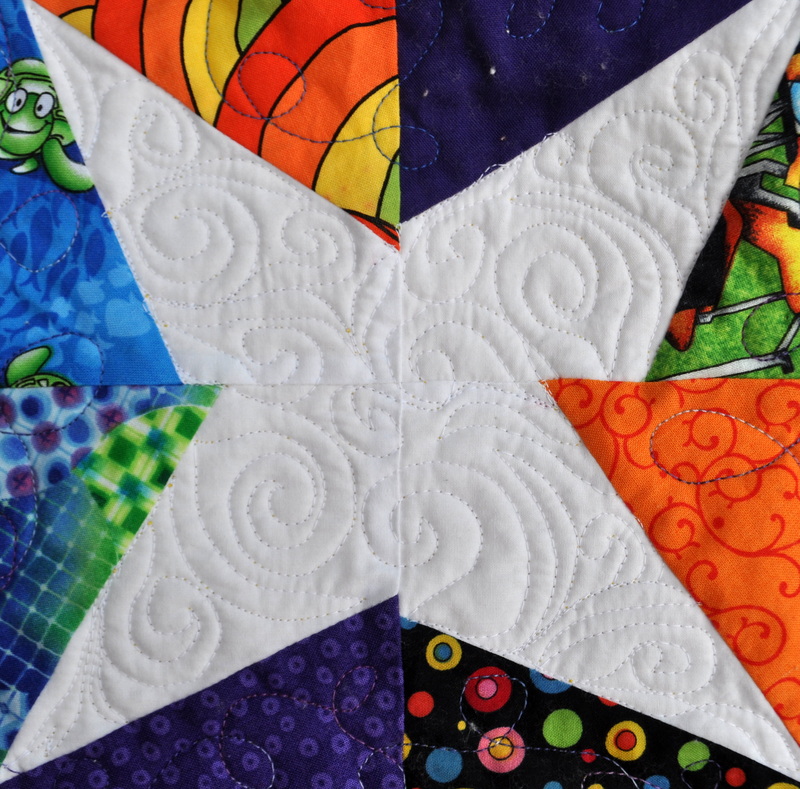 There are quilts made of squares, rectangles, circles, triangles, hexagons, and octogons. 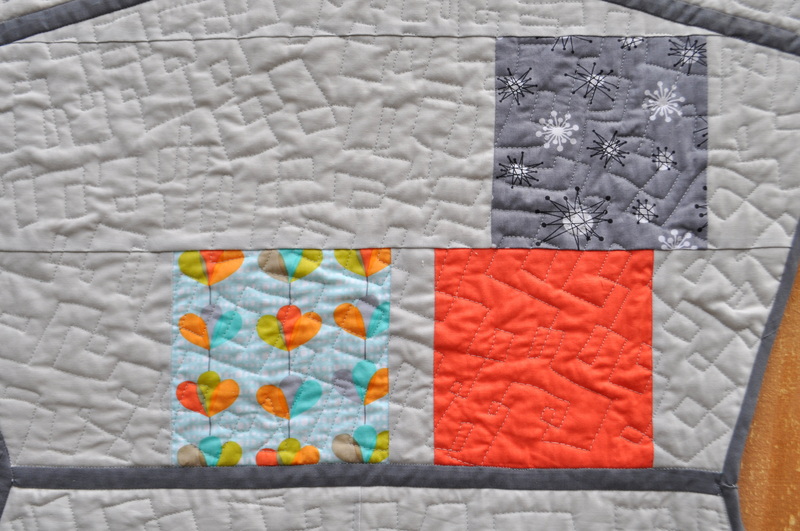 There are quilts made of strips, scraps, and generally wonky pieces. 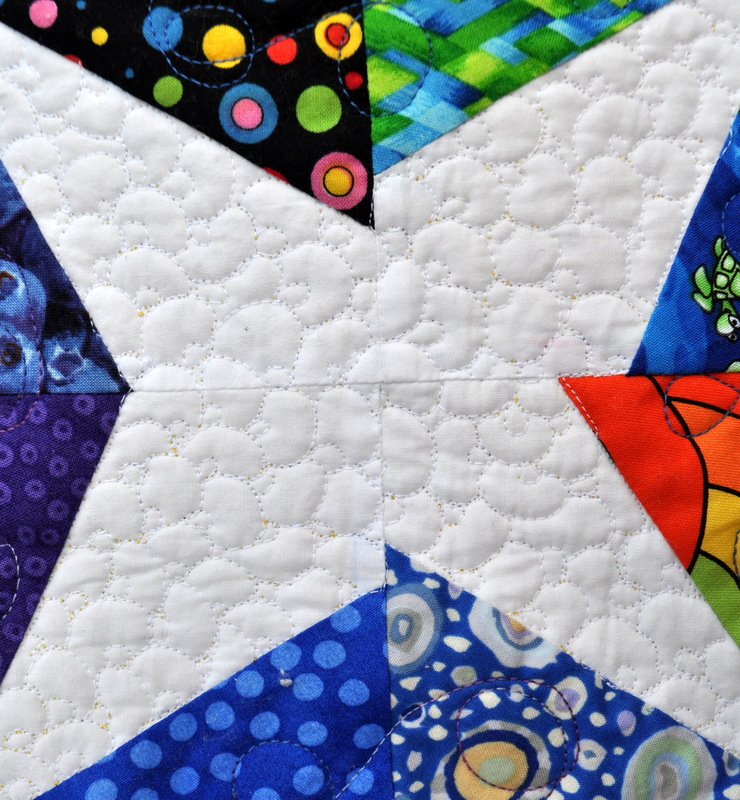 But I don’t remember ever seeing a quilt made with pentagons. Oh, there are quilts where the center of a square is a pentagon, but then the pentagon is squared up and you’re sewing squares together. And I think maybe I’ve seen English paper piecing pentagons, but those are like 2″ in size. I wanted to do pentagons on a larger scale. Then I found a picture of a pentagon bookcase and the idea for this quilt was born. On the top half of the quilt, the colored blocks and pieces are supposed to look as if they were sitting on a shelf of the bookcase. So the blocks are stacked, the books are laying at an angle, and the flower arrangement is lying on an angled shelf but not at the very edge. I made these blocks and a few others and they sat on my design wall for about 6 weeks while I just stared at them. As I stared, I thought that an entire quilt made like this might be boring. You can only have so many books on a shelf before the eye gets bored and you’re ready to move on to other things. So I designed the small wonky diamonds that would be small bursts of color on the right side, and stared some more. I wasn’t sure what to do with the rest of the quilt. As the deadline for the challenge drew closer and closer (it is today by the way), I decided that I likely wasn’t going to make it. Then this past Sunday night around 9pm, in a burst of creativity, I decided I was going to finish the quilt in time for the challege. I still wasn’t sure what I was going to do with the rest of the quilt, but I decided I could figure it out as I went along. I was up ’till 2am that night, cutting and measuring, designing and sewing, and by the time I went to bed I knew how I was going to finish the top. I took a half-day off work on Monday on finish the top and put the sandwiches together, and then spent the last several nights quilting and binding. And voila, after a stare down contest and lots of freezer paper, it’s done and just in time to be submitted before the deadline. 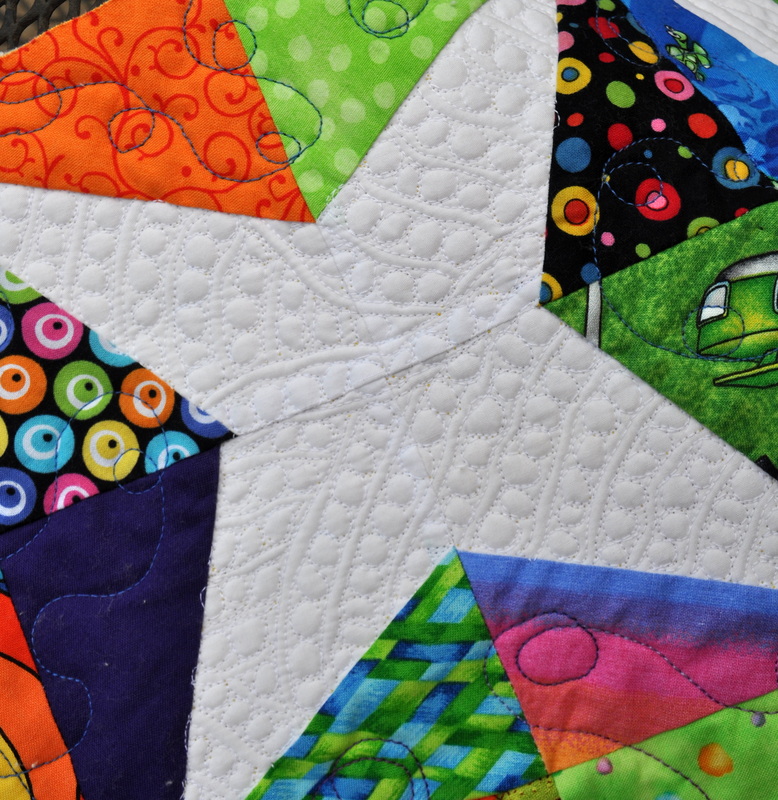 What I learned in the process… there is good reason no one uses pentagons in a quilt. Hahaha! The horizontal pentagons are a different size than the vertical pentagons, otherwise they wouldn’t sandwich together properly. And then sewing them together requires Y-seams at strange angles, which is not exactly easy. And then what do you do with the edges? 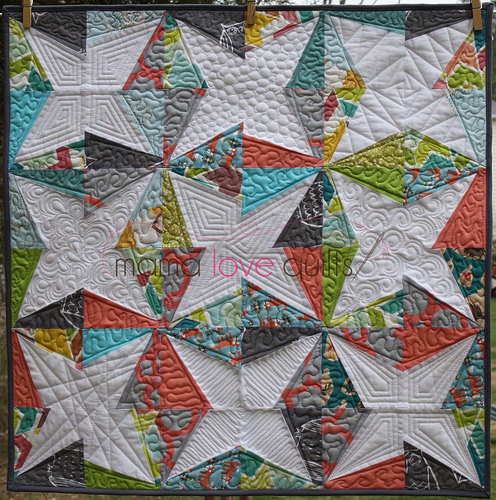 As you can see, I chose to leave mine as angles and have a zig-zag type quilt rather than a rectangular quilt. Which created a whole different problem… how do you bind inside corners? Thanks to you tube I figured it out! I really like how the quilt turned out. It is risky. 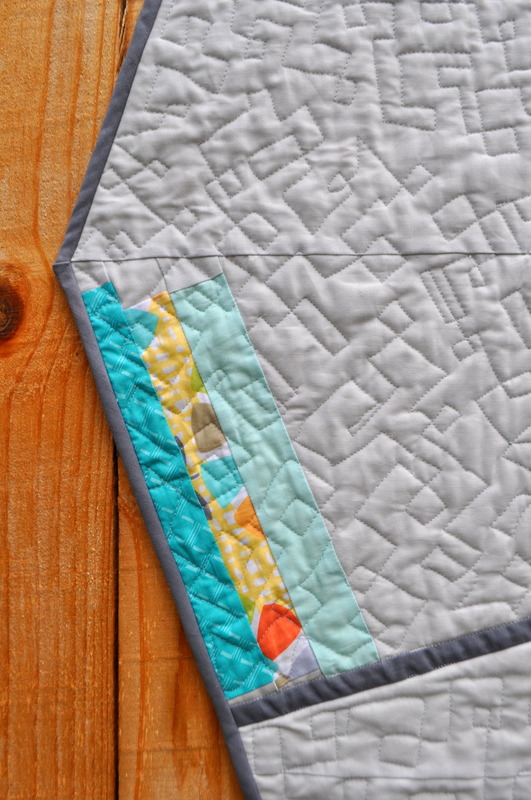 It’s definitely not your run of the mill quilt. But I learned a lot and it was a huge step in boosting my creativity, so I think it was a good project in the long run. A couple of months ago, March I think it was, I took a class at Spoonflower with Nicole at Mama Love Quilts Nicole makes beautiful quilts, so not only was it an opportunity to possibly learn something new from a great quilt maker, but I was intrigued by the sample quilt. 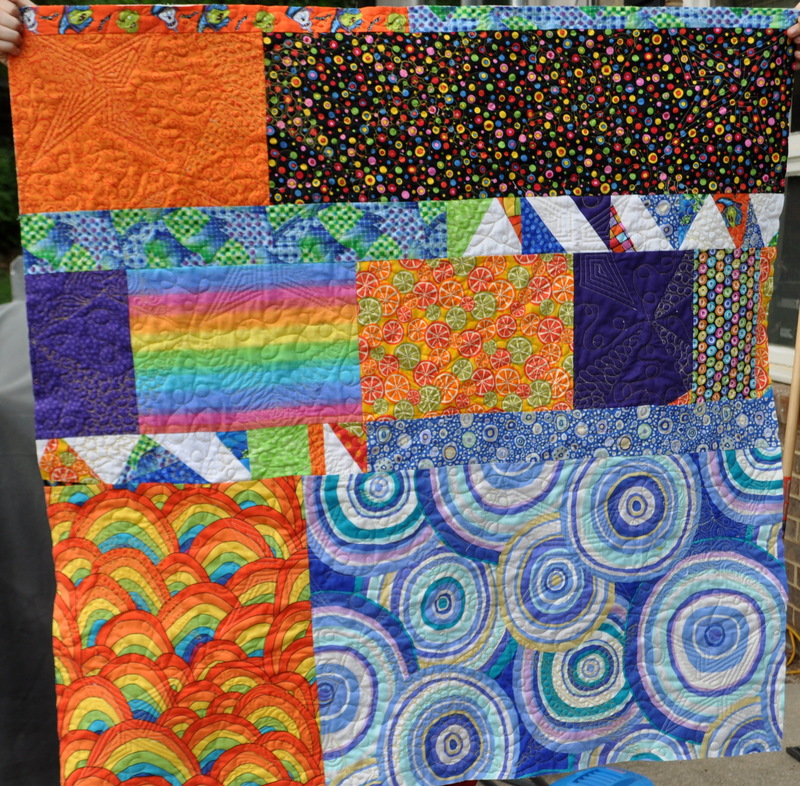 Here is her quilt. Also, if you’ve not heard of Spoonflower, check out my post here. None of the seams for the stars lined up so I was very interested in how this pattern was written. And the class was free, so I really had nothing to lose. Imagine my surprise when I found out that it used improv piecing and wasn’t a pattern in the typical sense. I have never really done any improv piecing, but it didn’t take me long to get the hang of it. And it was quite fun and freeing. There are no rules, and no pattern — in fact, the wonkier, the better. I decided to use scraps rather than cut up some of my stash, so I pulled out all my bright scraps from past projects. I also decided to make my quilt large enough to be a baby quilt. 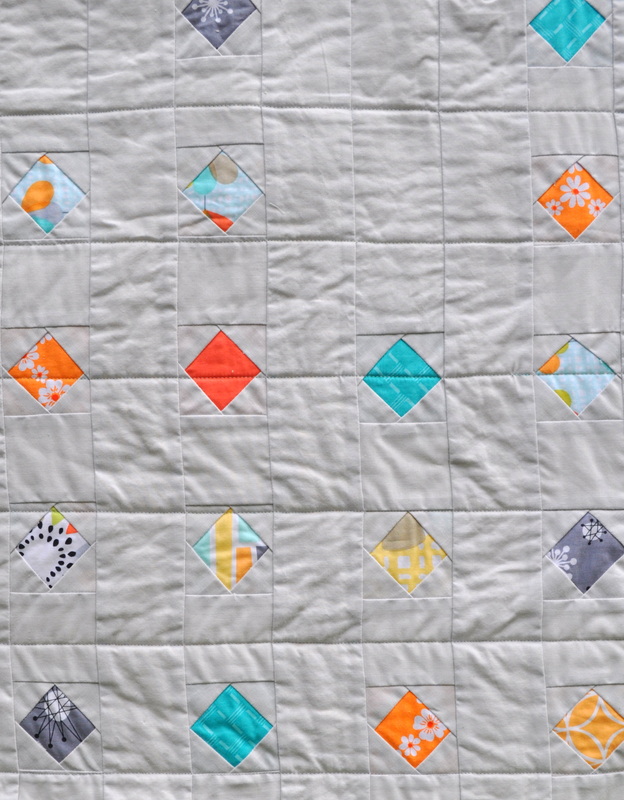 What’s really exciting about this quilt is that I have fabric from at least 8 other projects represented here. I still need to bind it, but that should be done later tonight. I used scraps for the back. Also, one of my goals this year was to practice my free motion quilting and get somewhat better at it. So I used 4 different free motion quilting techniques on this quilt. 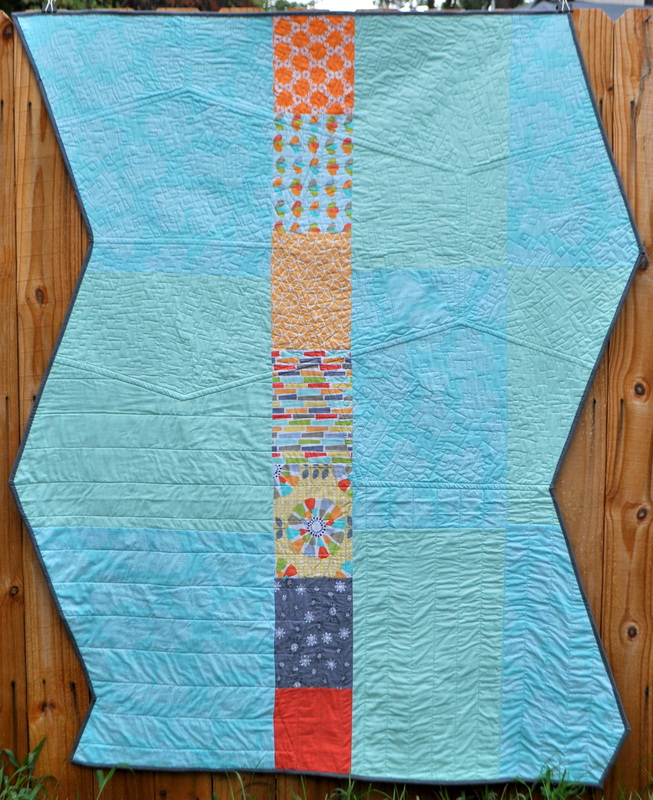 By the time I got done with the quilt, I was certainly better at the FMQ patterns I had decided to do. Now to start the binding. Have a blessed weekend! 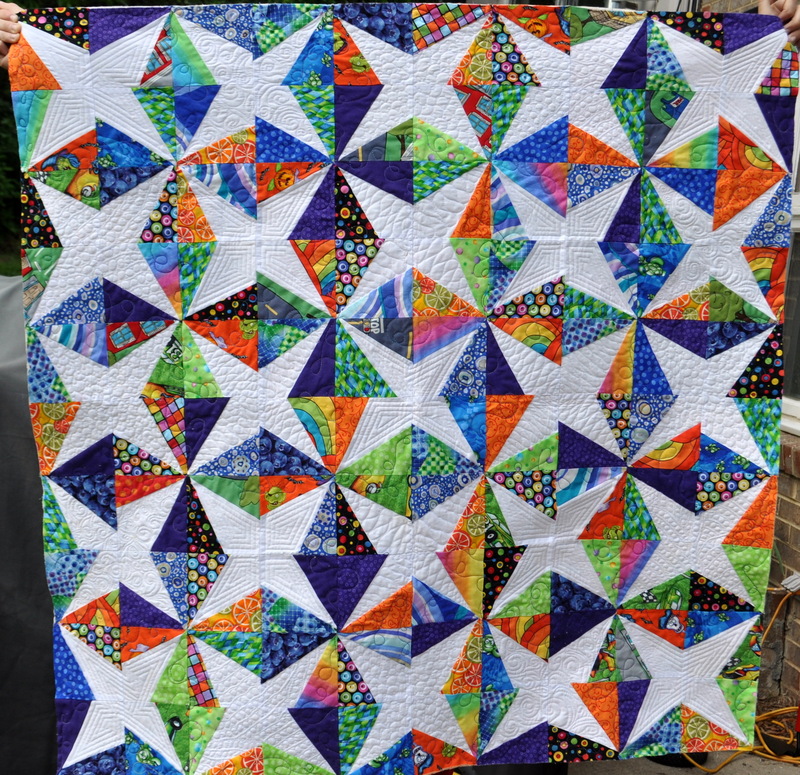 Linking up with Finish it Friday at Crazy Mom Quilts.